I started learning about propagation because I wanted edible and medicinal perennial plants for my budding homestead and I quickly realized that buying them in any kind of quantity would cost more than I was prepared to pay. So my adventure in plant propagation began. I set up a little nursery of desirable species by sourcing cuttings from friends, grafting onto the wild crab apples on my land, and planting seeds. It took way more time than the nursery-bought alternative, and it was not always tidy or efficient, but I learned a ton. Helping plants to grow and reproduce uplifts the spirit, induces a reverence for nature, and can even nourish the body. I hope you will seek the magic out for yourself and share the joy with your family. Learn about (and eat) wild edibles. What better way to learn about plants than to digest them? As we know, an experience that engages all five senses will stick in the mind far longer than a paragraph read on the internet. You’ll feel the texture and taste of the plant on your tongue, and feel the way it sits in your stomach. Go on a wild edible walk with a knowledgeable guide to learn what’s safe and good to eat. 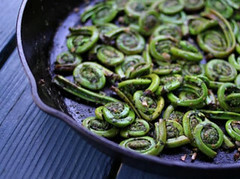 Taste the surprising sweetness of black locust flowers, crack open your first shagbark hickory nut, bring home a sack of fiddleheads and sauté them up (as my wife has done the past few springs) for your loved ones. There is a world of gastronomic delight right outside your door. Nature’s Garden by Samuel Thayer is the most enjoyable book on the subject I’ve encountered. Though I haven’t personally taken any, I hear Earthwork Wilderness Survival Training School offers informative classes all through the summer and fall. 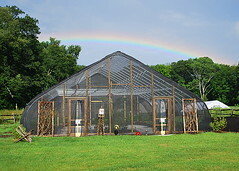 Promoting the connection between native habitats and local wildlife, Project Native has opened a Native Butterfly House open to the public at its native plant nursery in Housatonic, just 4 miles north of Great Barrington, MA. Take a tour of this new educational facility on Friday, August 16th from 10am-12noon, or come to the kick-off party in the evening from 5-6:30pm. The new 35-by-55-foot structure encloses a garden of native plants grown at Project Native, all of which support the life cycle of native butterflies. Staff and visiting children have been collecting native butterflies from the Project Native property to populate the butterfly house, which is open to the public daily from 10 to 4. “This is a great addition to Project Native,” General Manager David Ellis said. “It is a terrific educational resource and a great attraction. It will serve as the keystone for our educational programs which show the importance of native habitats in sustaining our wildlife.” Groups of children have gone on butterfly safaris for several weekends in search of caterpillars and butterflies to populate the enclosed garden. There are two more butterfly safaris this summer, Wednesday, August 21st from 1-2:30pm and Saturday, August 24th from 9:30-10:30am. 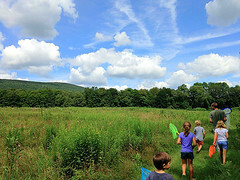 An advanced bug safari for kids ages 8 and oler happens on Sunday, Augutst 18th from 2:30-4:30pm. Project Native’s mission is to promote, restore and sustain native habitats in the Berkshire Taconic region. The 13-year-old non-profit organization grows native plants from seeds collected in the region and makes them available to the public. The fields and forests of the 54-acre former dairy farm have been largely cleared of invasive plants to restore its landscape with native habitats that include trails, a native-plant seed bank, and educational activities. Native plants as defined by Project Native, are plants that existed in the region prior to the arrival of Europeans in the 17th century.